VertiMax has created a patented jump training technology specifically designed to increase power in all phases of the vertical jump. By simultaneously targeting explosive leg power and arm swing velocity, athletes can maximize vertical lift and get unmatched vertical gains. 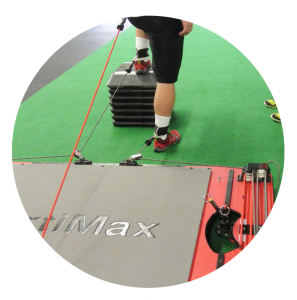 VertiMax offers the only speed training technology that can apply resistance to the glutes, quads, calves and hip flexors at the same time while sprinting, resulting in off-the-chart acceleration and top-end gains for any athlete. Alotech is the sports equipment contract manufacturer for VertiMax for jump training technology designed to increase power in all phases of the vertical jump. Originally a small company, VertiMax proved to be very successful with technology, but they had severe growing pains as their products got popular and the number of orders increased significantly. The main challenge prior to partnering with Alotech was order fulfillment. With the adjustment to rapid growth, they did not have the cash flow required to maintain strong financials. Additionally, lead times were as much as 6 weeks due to waiting on materials from Taiwan, so product fulfillment was slow. As the sports equipment contract manufacturer for VertiMax, Alotech purchased approximately $200,000 of inventory, freeing up capital for VertiMax to put into their marketing efforts. We refined the manufacturing process to improve consistency and quality. We were able to keep costs comparable and maintain existing profit margins while manufacturing much of the product in our American plant and leveraging relationships with other American manufacturers, decreasing lead times of the products. In less than one year of partnering with Alotech, sales increased 35%. Greater accuracy and consistency of production saves time & money. Working with a sports equipment contract manufacturer results in decrease in time spent dealing with manufacturing issues and allows more time to be spent on sales and marketing efforts. Prediction of failure led to a more consistent product. What originally took 12-18 months to manufacture and market, Alotech can produce in 6 months today. Today, only 10% of the parts come from Taiwan, as compared to 90% prior to working with Alotech. VertiMax Case Study – How does Alotech add value? Manufacturing Methods: Which Is Right for You?